As the newly appointed holder of the Bell University Laboratories Chair in Human-Computer Interaction, Matt Ratto focuses on bridging what he calls “the so-called great divide” between those who design and build human-computer systems and those who study them. His work involves connecting the builders, who are mostly engineers and scientists, with the critics, who come largely from the humanities and social sciences. An expert on 3D printing and digital fabrication, Ratto’s niche is in “critical making,” a term he coined more than a decade ago to describe the making of material objects as a means of engaging with both the practical and theoretical. At the Faculty of Information’s Critical Making Lab, where Ratto is the director, research participants build devices such as wearable computers, Radio-Frequency Identification systems and ubiquitous computing networks. In making these devices, researchers are trying to understand “how technology and society are being built,” says Ratto. “They can then take the insights and use them in technological design.” It is making for far more than making’s sake. According to Ratto, the interdisciplinary field of Human-Computer Interaction, which bridges humanities, social sciences and engineering, has been changing in recent years. “There’s an increasing recognition of the need to incorporate cultural and social values,” he says. Over the years, Ratto has also modified his personal approach to HCI. He came to the conclusion that “doing critical making in the lab was an insufficient way to actually affect society.” He wanted to take the insights gained to inform the technical design of an actual system. By this point, the Critical Making Lab was becoming known for its work, especially in 3D printing. The lab had made headlines and heightened public awareness when it 3D printed a functional plastic gun in 2013. On a less controversial note, insights on prosthetics and technology, which originated from a series of critical making workshops in 2012-2013, were used as the core concepts to 3D scan, design and print prosthetic limbs. By 2014, the Critical Making Lab had partnered with an international NGO and a Ugandan hospital to trial the prosthetic limbs in Uganda. “We built a system that manages the relationships differently,” explains Ratto, noting that the team rejected a model which would have seen Ugandans doing the manual labour needed to measure and fit prosthetics while design work was done in Canada. The resulting systems, now installed in prosthetic clinics in Tanzania and Cambodia as well as Uganda, are intended to support a more equitable and just relationship between prosthetists in developing world clinics and their developed world counterparts. 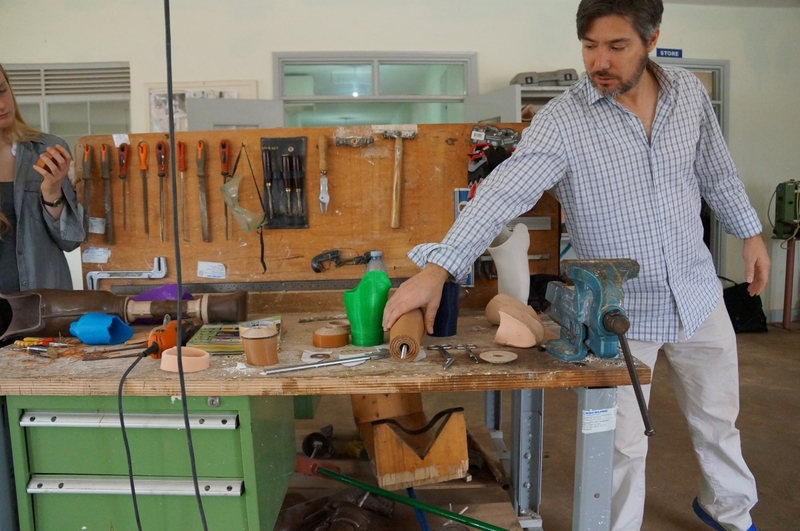 The Ugandan prosthetists do all three steps – the 3D scanning, designing and printing – which both supports their professional development and encourages adoption of the system. “The most important thing we should be doing around HCI is getting the human more into it,” says Ratto.